Blind Baking is the process used to pre cook a pastry crust without the filling. It is used in cases where the proposed filling to the crust either does not require cooking, does not require as much time to cook as the pastry or if the filling is too liquid and would make the crust too soggy if you were to attempt to cook the pastry with the filling inside it. Once you have your pastry shaped inside its dish or tin and have chilled it in the freezer for about 30 minutes, line it with grease proof paper or aluminium foil. Next, fill the lined pastry with Baking Beans. Baking Beans is actually a fairly general term. 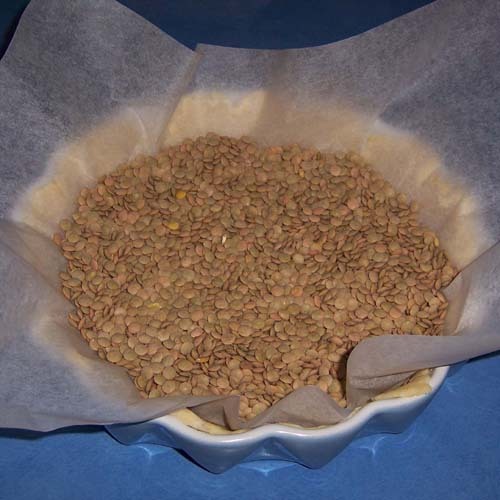 You can use dried Beans, lentils, peas, almost any other dried pulse or even special ceramic balls. 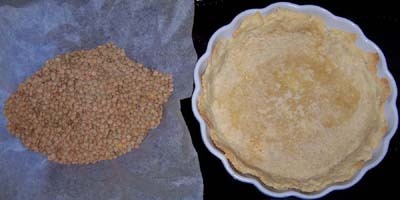 The weight of the Baking Beans keeps the base of the pastry flat and strong during the cooking process by preventing things like air bubbles from making deform by rising in places. The cooking time is normally around 15 minutes at 200 degrees Celsius. However the ultimate decider on how long the pastry needs to bake is the colour. You should aim for a nice golden brown colour in the finished pastry so if the filling for the pastry does not require cooking you should blind bake the pastry crust for a bit longer than if the pastry will be going back into the oven to finish cooking with the filling inside.